Kansas’ largest film festival turns 15 this year and organizers are planning an even bigger and better Tallgrass Film Festival. Lela Meadow-Conner, creative director of the Tallgrass Film Association, said festival organizers are inviting a larger group of film professionals – including alumni from Tallgrass Film Festival’s first 14 years – to help celebrate the milestone anniversary. She also promises parties fit for a 15th birthday and other special surprises throughout the five-day festival, Oct. 18-22 at a variety of venues in downtown Wichita. The festival has grown to nearly 200 films screened for 16,500 attendees by offering an environment that attracts filmmakers and giving attendees a true festival atmosphere. She said filmmakers from around the world – including 123 who attended last year – comment on the quality of the audiences at Wichita’s film festival and how integrated the festival is in the Wichita community. In addition to full-day schedules of movies at locations throughout downtown, Tallgrass throws parties, offers panels on a range of industry topics and hosts Q&A sessions with visiting filmmakers. There’s also a VIP Lounge with an open bar, food, drinks, house DJ, chair massages and more that is accessible to fans that purchase a VIP TALLpass for $250. Tallgrass Film Festival tickets are $10 for one film. There are several packages and passes available, including a new $65 Binge pass that gives you full access to programming on Saturday, which means more than 25 films including a late night movie, the Stubbornly Independent Gala and After Party and you’ll also get access to happy hour in the VIP Lounge. This year a volunteer group of 30 movie-loving Wichitans has watched more than 2,000 independent films, those made with a smaller budget and outside the major studio system. Toward the end of September, check tallgrassfilmfest.com for a list of the films selected, which will include documentary, narrative, short films, world cinema, animation, LGBT, retrospective and premiering films. About two weeks before the festival, the full schedule will be available in print and online. Four films to be screened have already been announced: Leena Pendharkar’s 20 Weeks, Chris Hansen’s Blur Circle, Jameson Brooks’ Bomb City and Dustin Cook’s I Hate The Man In My Basement. These are the competitors for the flagship “Stubbornly Independent” competition, which rewards an independent film or filmmaker who takes risks and isn’t afraid to tell important stories, and does all of this within the ultra-low budget of $500,000 or less. Tallgrass programmers spent more than 500 hours viewing and curating 98 eligible films for the highly selective program. The winner will be announced with the Tallgrass Film Festival lineup in late September, and all competitors will be screened during the event. A newly created section comprised of feature-length documentaries directed by women will debut at this year’s festival. Finalists for the DOX Spotlight Section will be selected by the Tallgrass Film Festival Programming Committee and will then be reviewed by a three-woman jury of industry professionals and filmmakers. The top film as selected by the jury will screen as part of an evening spotlight during the festival with a post-screening Q&A. All other finalists will be screened in regular competition at the festival, as well. 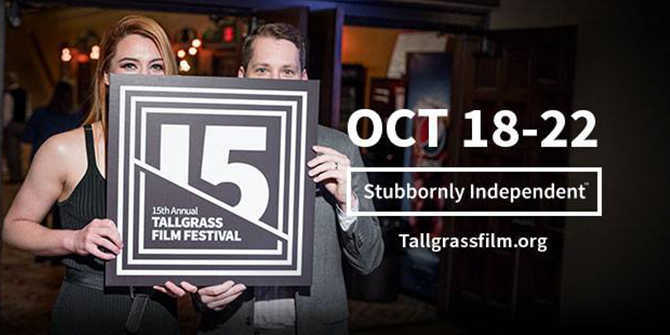 Make plans now to attend the 15th annual Tallgrass Film Festival Oct. 18-22 in Wichita. It’s one of the best times for out-of-towners and locals to explore downtown Wichita, even if you’re not a film aficionado. With nearly 200 movies showing in five days, there’s something for every taste and much more than movies to be enjoyed. For a local’s perspective, read this blog post from the 2016 festival. For a complete list of events and times, click here.